Italian rabbi and Talmudist; lived about 1110-70; born in Siponto, a seaport of Apulia and an ancient seat of Jewish learning. His father was known there as an erudite Talmudist and was connected with the bet ha-midrash; Isaac has sometimes been confounded with him (see Neubauer in "Ha-Maggid," 1874, No. 5; Zunz, "Literaturgesch." p. 163). For unknown reasons Isaac removed to Salerno,where he met the traveler Benjamin of Tudela, who subsequently referred to him as "the great rabbi" ( ; "Itinerary" of Benjamin of Tudela, ed. Asher, i. 13 [Hebr. part, ii. 29]). Isaac addressed a legal question to his contemporary R. Tam, which the latter answered in a responsum (see "Or Zarua'," ii., § 52). He wrote also a letter to the rabbis of Rome to get an explanation of an obscure mishnah (R. Tam, "Sefer ha-Yashar," §§ 548-549; comp. Berliner, "Peleṭat Soferim," pp. 8, 46). It is improbable that the Greek Talmudist whom Abraham ibn Ezra derided on account of his deficient knowledge of Hebrew was identical with Isaac ben Melchizedek of Siponto, as Grätz suggests ("Gesch." vi. 372). His son Shiloh is mentioned in "Sefer ha-'Iṭṭur" (ed. Lemberg, i. 14b). Isaac, one of the earliest Talmudists of lower Italy, wrote a commentary on the Mishnah, probably on the whole of the Mishnah, though only the part on Seder Zera'im has been preserved (Neubauer, "Cat. Bodl. Hebr. MSS." No. 392); this part has been printed in the new (1890) Wilna edition of the Talmud; Bik. ii. 4 to the end was printed long before as an addition to Simson of Sens's commentary. Isaac's commentary on Seder Ṭohorot is often quoted (see Azulai, "Shem ha-Gedolim," i. 106), especially by Simson of Sens. Fragments of it are to be found in R. Tam's "Sefer ha-Yashar" (l.c.) and in a Rashi and RaSHbaM manuscript described by A. Berliner ("Monatsschrift," xiii. 217, 223). His methods of explanation are concise and clear and similar to Rashi's. Most of his explanations are original, and some of them are based upon Greek, Arabic, and Italian linguistic analogies; fantastic explanations, of course, are not wanting. He quotes the two Talmudim, the Sifre and the lost Sifre Zuṭa, the Targum, the Seder 'Olam, the "'Aruk" of Nathan ben Jehiel of Rome, Hai's commentary on Zera'im and Ṭohorot, and R. Nissim's "Mafteaḥ." 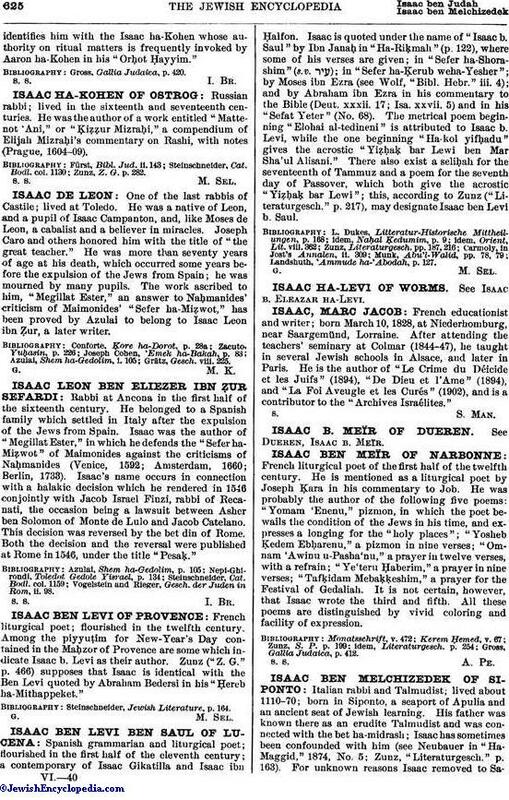 Isaac's merit consists in having paved the way for the study of the Talmud in Italy. He did for that country what Rashi had done for Germany and northern France, though to a slighter extent, being a man of less authority. 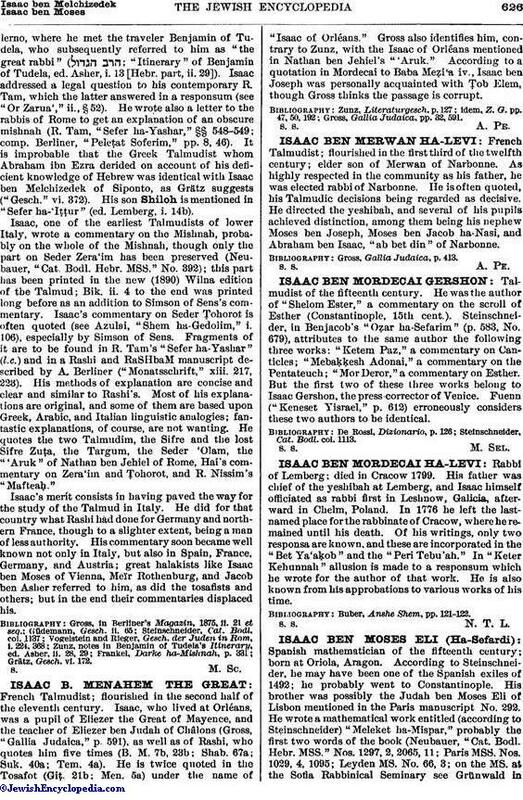 His commentary soon became well known not only in Italy, but also in Spain, France, Germany, and Austria; great halakists like Isaac ben Moses of Vienna, Meïr Rothenburg, and Jacob ben Asher referred to him, as did the tosafists and others; but in the end their commentaries displaced his.